Senators seek to drag more workers into unions. Several US senators who have been named by inside the DC Beltway pundits as potential contenders for the 20202 Democrat [residential nomination recently banded together to introduce legislation that would greatly expand Big Labor’s legal power to corral workers into unions whether the workers want them or not. 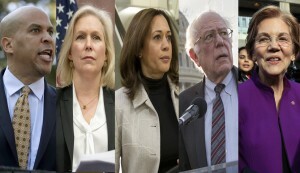 On May 9, Sens Bernie Sanders (I-Vermont), Sherrod Brown (D_Ohio), Kirsten Gillibrand (D-NY), Kamala Harris (D-calif), and Elizabeth Warren (D-Mass), along with seven other members of Congress’ upper chamber, introduced the cynically misleading “Workplace Democracy Act”. , S.2810.